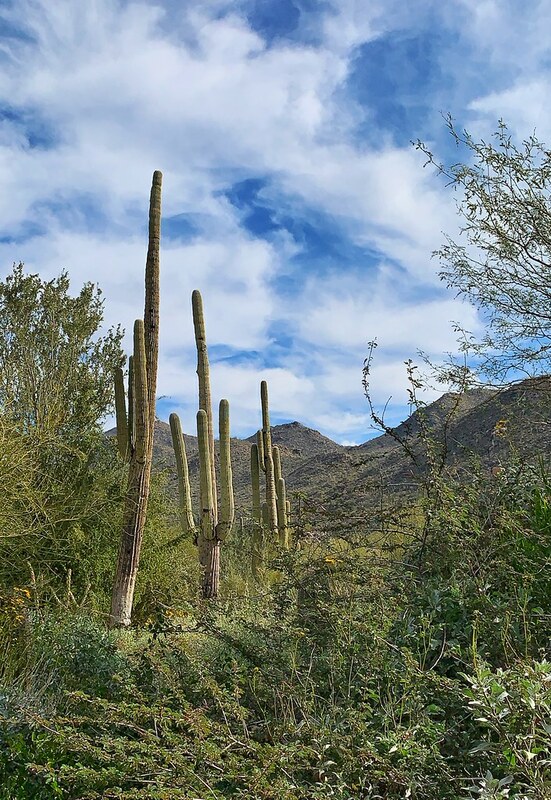 The Ritz-Carlton, Dove Mountain is a desert luxury experience nestled into the historical foothills of the Tortolita Mountains, where the Hohokam tribe resided until 1450 AD. Alex and I thoroughly enjoyed our stay sponsored with the Ritz-Carlton. It was a weekend getaway filled with a divine culinary experience and plenty of relaxation. As someone who is always on the go, I felt at ease during our visit. The Ritz-Carlton is one of eight luxury resorts recognized by the Forbes Travel Guide 2018 Verified Lists of the World’s Most Luxurious Hotels and World’s Most Luxurious Spas. 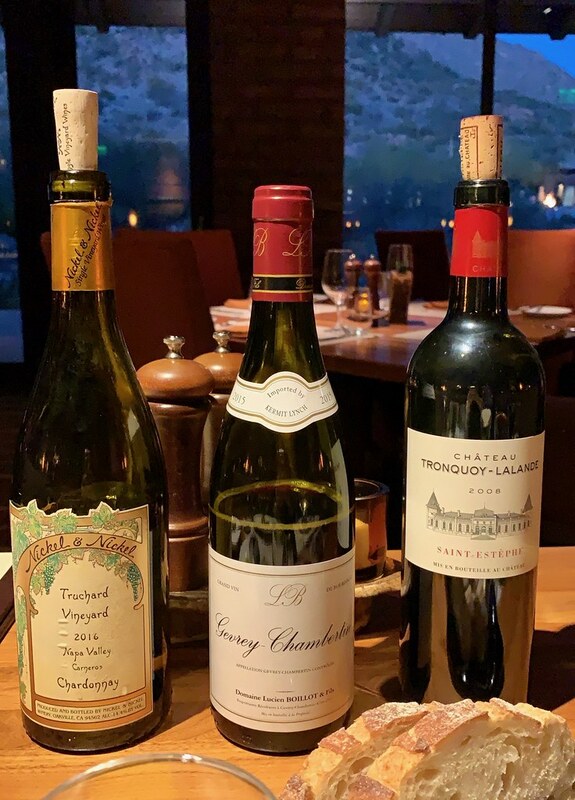 There are only three properties in the continental United States with this accolade, however the Ritz-Carlton, Dove Mountain is the only western property. 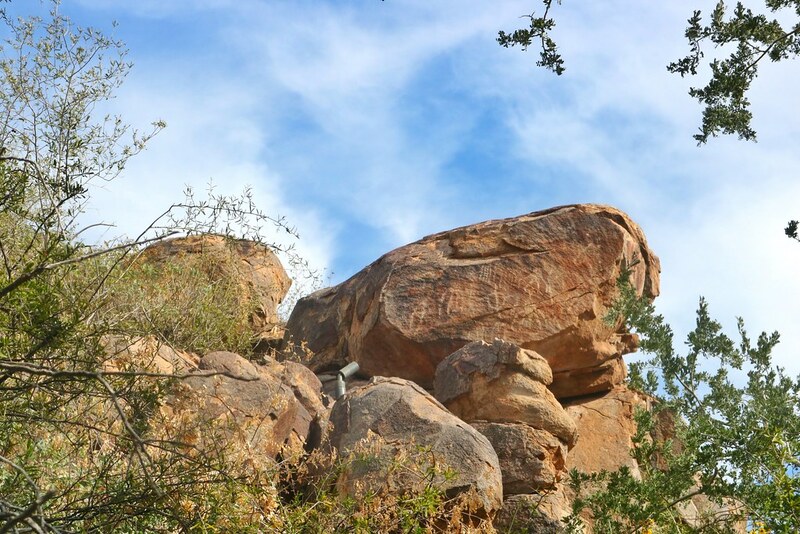 At the Ritz-Carlton, Dove Mountain you're immersed in the Sonoran desert's culture of the past and present. The designers of the Ritz-Carlton integrated natural elements of wood, stone and steel, accompanied by rich-hued fabrics to complement the ambiance. The designs create a warm and soothing environment that further enhances the gastronomy experience. 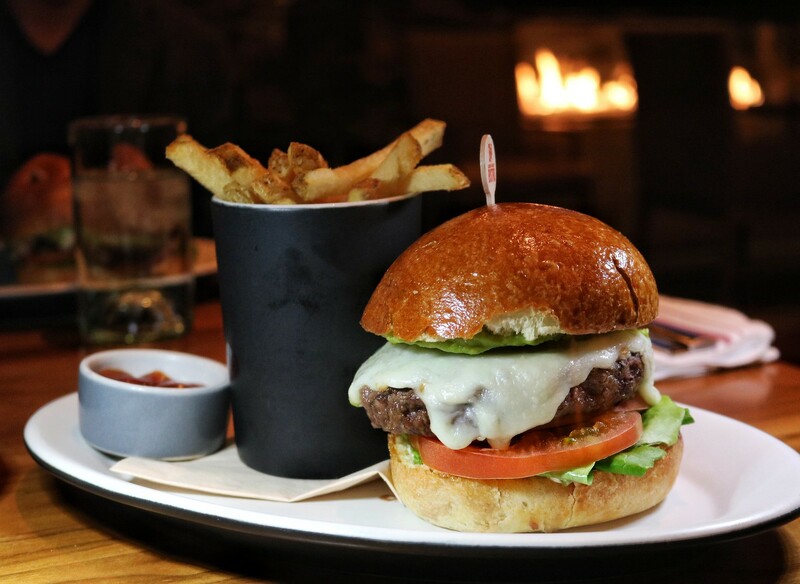 Our culinary itinerary included eating at the following restaurants owned by the Ritz-Carlton: CORE Kitchen & Wine Bar, Cayton’s CB2 Burger Bistro, and the Ignite Lobby Lounge. culture of the past and present. 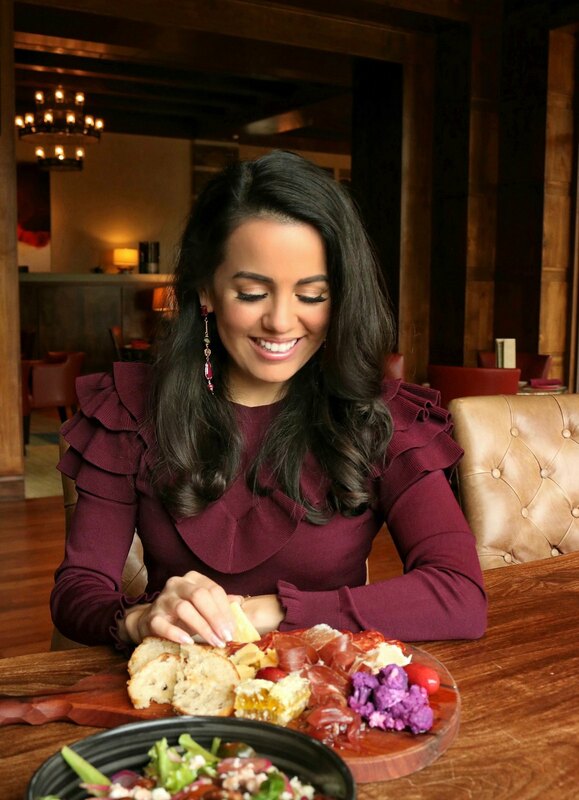 These outstanding options are filled with delicious visions from the hard work and expertise of Executive Chef David Serus and Executive Pastry Chef Daniel Mangione. David Serus was named a Maître Cuisinier de France (Master Chef of France) from the French culinary community. To join this nearly 70-year-old organization, a chef must be French and then nominated for their superior levels of culinary skill, artistry and commitment to French gastronomy. Serus worked for other Ritz-Carlton's properties before landing his position in Tucson. Daniel Mangione's background is unique in that he started his pastry endeavor at 17 years old as a bread boy at a Ritz-Carlton in Pasadena. He later interned for the Ritz-Carlton in Naples through the Culinary Institute of America. 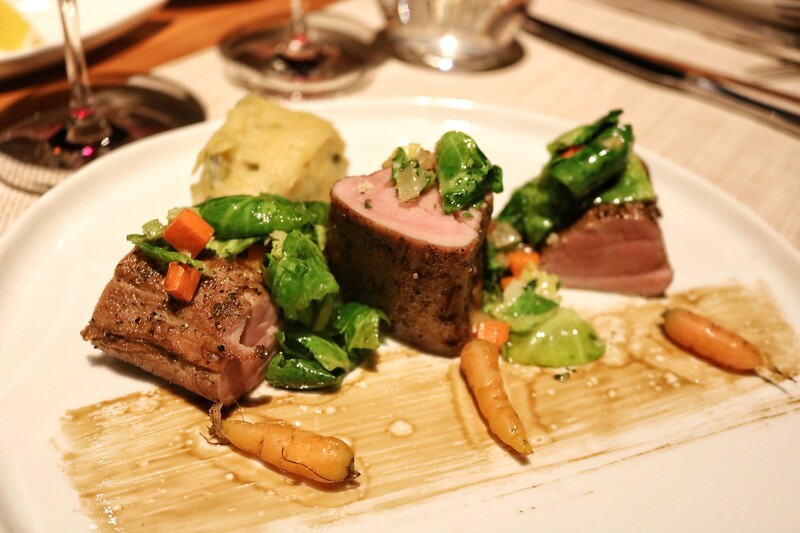 Serus and Mangione are no strangers to creating a balanced menu for one another. The two chefs worked together in at the Ritz-Carlton in Washington, D.C. prior to their roles in Arizona. to creating a balanced menu for one another. 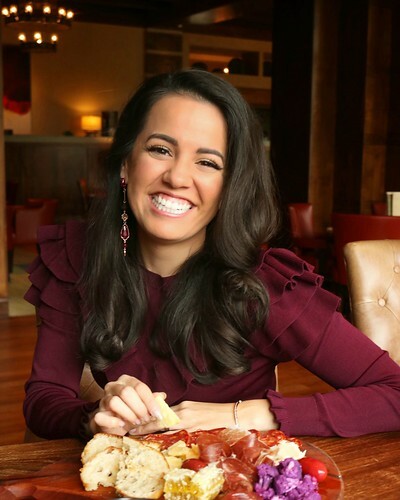 Both Serus and Mangione's tenure with the Ritz-Carlton expands for many years. Their dedication to guest satisfaction and indulgences is part of what sets the Ritz-Carlton apart from others. With such high culinary expectations, Alex and I were eager to celebrate our anniversary with one of our favorite pastimes... eating! That weekend we celebrated 12 years of unity and an early-wedding anniversary. Aside from the food, we couldn't wait to see the property and the recent $10 million resort renovation. The upgrades primarily targeted the guest rooms, property amenities and conference rooms. Our executive suite was one of the 253 guest rooms that received a floor-to-ceiling transformation. The room consisted of two balconies, one bathroom, one powder room, one lounge room, one bedroom and a walk-in closet. Alex and I opened the balcony doors and instantaneously fell in love with our mountain view filled with cacti. The cool desert atmosphere was tranquil and we were to able to breathe in the fresh in between exploring the menus from the restaurants. Ignite Lounge & Bar is one of my favorite spots to leisurely pass time. Ignite sits just past the main entrance lobby with seating both inside and outside. From the crackling fireplaces to the newly installed library of Arizona-related books, it's an ideal way to enjoy a bite while taking in the beautiful canyon view. The bar within Ignite serves an variety of house cocktails but will stir, shake, or pour classic favorites as well. During the early evening Ignite offers a mixology class open to guests, which Alex and I look forward to experiencing during our next visit. 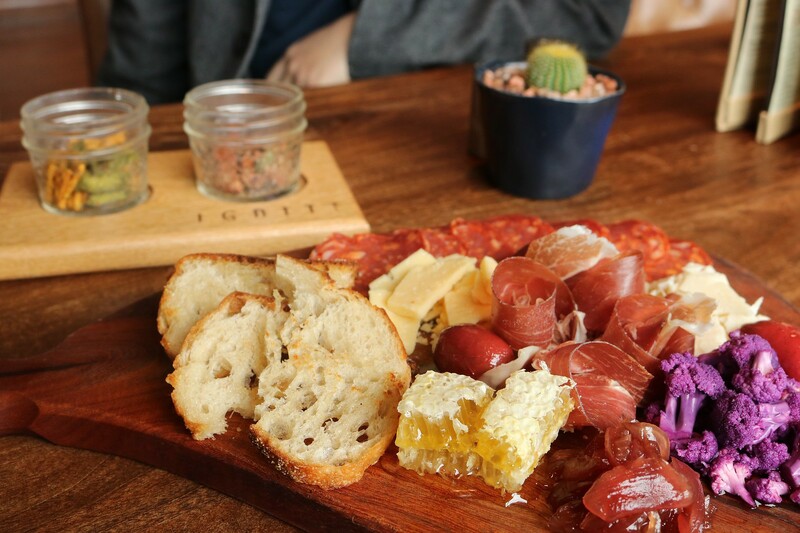 Many of the menu items at Ignite are crafted through the utilization of local products. They wish to provide that sought-after and authentic southwest experience. I love when restaurants support our local farmers and I find it commendable they work with such a vast list of local vendors. To reach CORE Kitchen and Wine Bar, we walked down the flagstone corridor in the lobby of the resort where the steel chandeliers lit our path. We descended the stairs and were greeted by the trickling sound of a waterfall art on the wall. The environment is different depending on the time of day and is a strategic design to fit both settings. CORE is surrounded with large-panel windows that go from the floor to ceiling. There is plenty of natural light that stretches throughout the space. There is a large table centered before the dining area that is filled with fresh lox, savory meats, a yogurt station and more. If you're the type who prefers a variety then I fully recommend selecting the American Buffet. However, if you're like Alex and me and you prefer your food made-to-order, then go with the CORE Features. 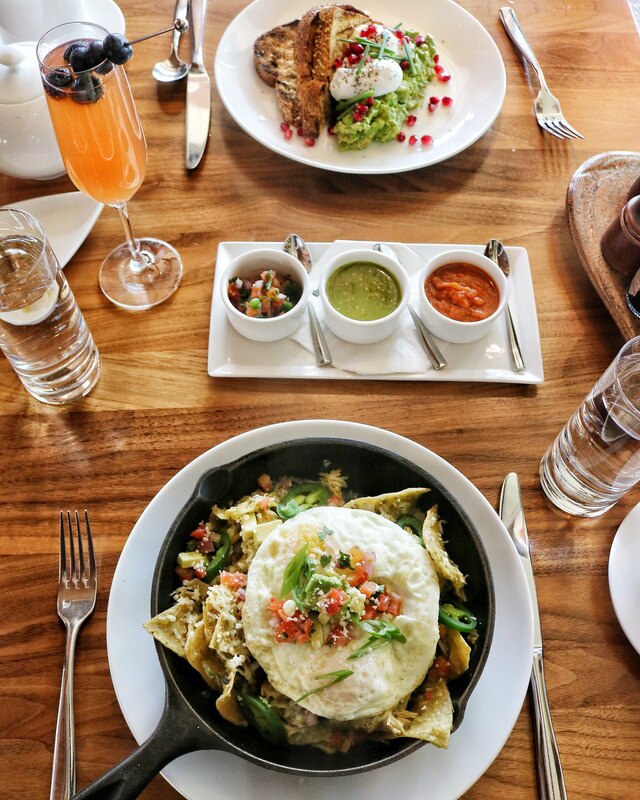 We spoke briefly with CORE's chef de cuisine, Devin Pinto, and he recommended to us the chilaquiles and huevos rancheros. Items like the chilaquiles and prickly pear mimosas are based on the surrounding region.The chilaquiles uses chicken thighs that are braised with a light tomatillo salsa and then pulled. The dish itself incorporates a more robust salsa to give a southwest flavor. The warm atmosphere and lightly rumbling fireplace truly set the ambiance. 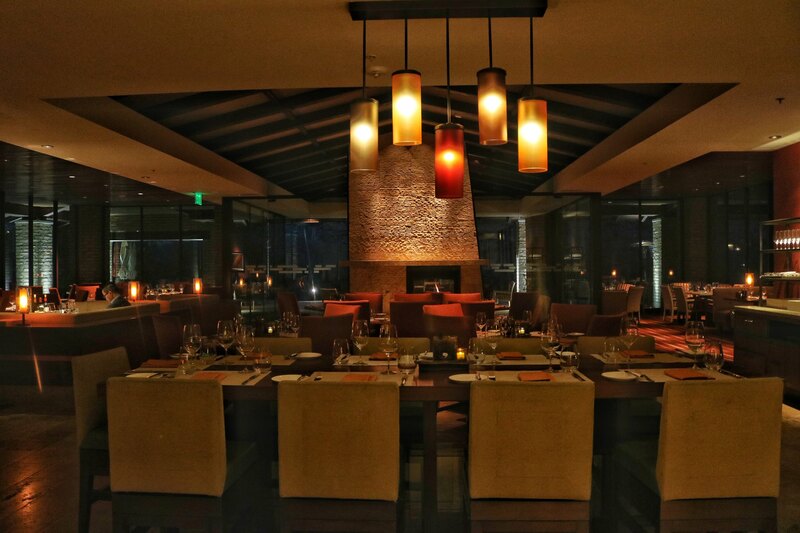 The dimly lit table heightens the taste of food and overall experience. A sommelier is readily available to assist you with finding a pairing. We are particularly drawn to reds but wanted a white for the seafood plates we ordered. Our sommelier, Jennifer, recommended the Nickel & Nickel's 2016 Truchard Vineyard, Carneros, Napa Valley. This pour was crisp and is a new favorite we've added to our list. Peach and pears, with a hint of tropical flavor, are the main notes in the wine. Malolactic fermentation is eliminated from the wine-making process because the vineyard naturally produces a broad mouthfeel and great presence. The chardonnay paired fantastically with the pan-seared scallops. The scallops are sent from California and are plated beautifully. 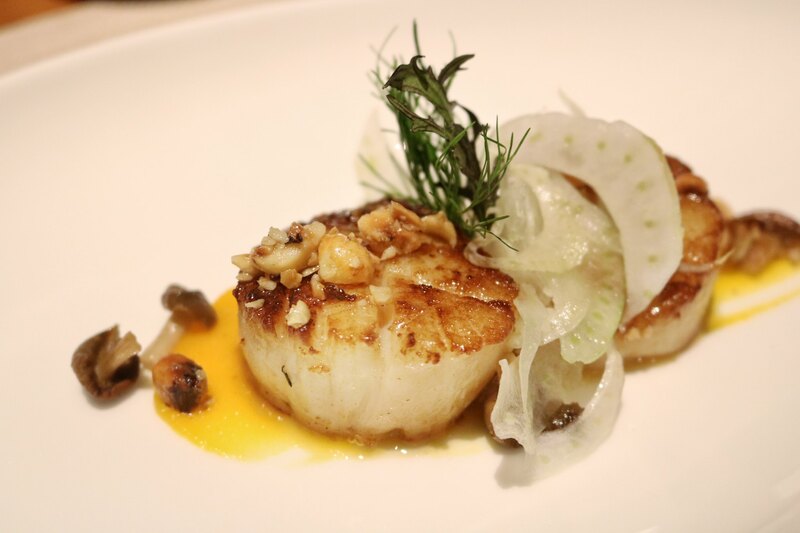 Two scallops are placed on a brush of puréed butternut squash, then topped with shaved fennel, beech mushrooms and a roasted nut medley. The nut medley includes pecans from Green Valley Pecan Company. For dinner we opted to go for a seasonal plate, monkfish, as well as a CORE feature, kurobuta pork tenderloin. Kurobuta is the Wagyu beef of the pork world. The meat comes from a Berkshire pig and is sought out after for it's tenderness and juicy flavor. 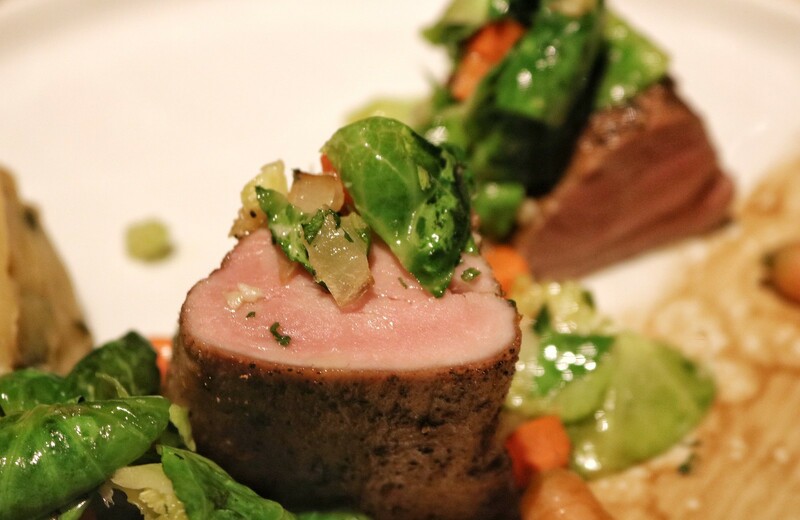 With such a beautiful quality of pork, CORE chooses to sous vide the meat at 130 degrees Fahrenheit before searing. An apple balsamic reduction is brushed onto the plate. Baby carrots, onion and celery are sautéed with butter, herbs and shallots. Brussels sprouts leaves are then added as a final touch. One of our favorites flavors of the dish was chili white sweet potatoes that were folded with roasted poblano peppers. When production allows, vegetables are sourced locally from Maggie's Farm. Midway through our meal, we were greeted by Executive Pastry Chef Daniel Mangione who reminded us to save room for his desserts! By now you may have recalled Mangione from my Ritz-Carlton gingerbread post and how he crafted a full-sized adobe house made from gingerbread. If you know me, you know dessert is my absolute favorite and I had been anxiously anticipating the desserts made by Mangione. The gluten-free and vegan chocolate cake could easily fool you into thinking that you're eating something without either of those words. The chocolate cake was rich and had a soft texture that made all mouths smile. Pair this with the southwest-inspired prickly pear sorbet and you have dynamically, contrasting flavors. The raspberry coulis drizzle and the berry gel, partially covered with shimmering 24 karat loose-leaf gold, create a work of art. 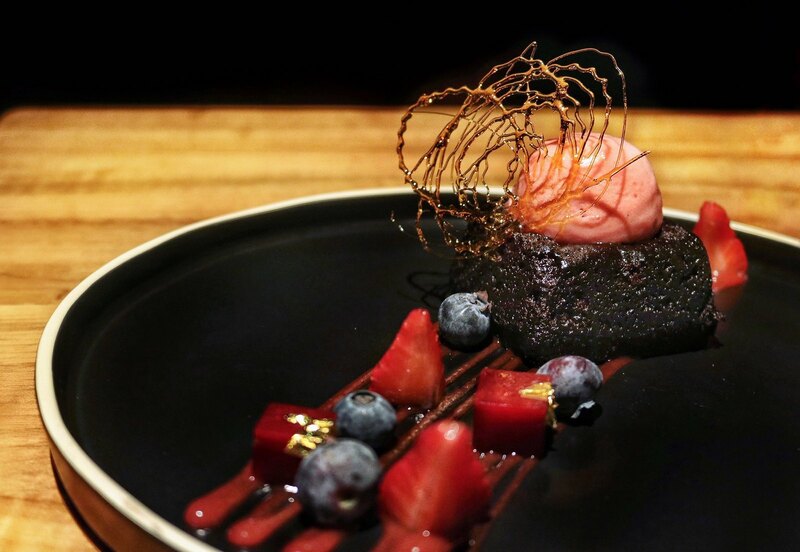 The intricate dessert is then topped with an abstract sugar art. I was torn between admiring the dessert and wanting to dive in. You will be pleased to know this dessert is now available at the Ritz-Carlton! 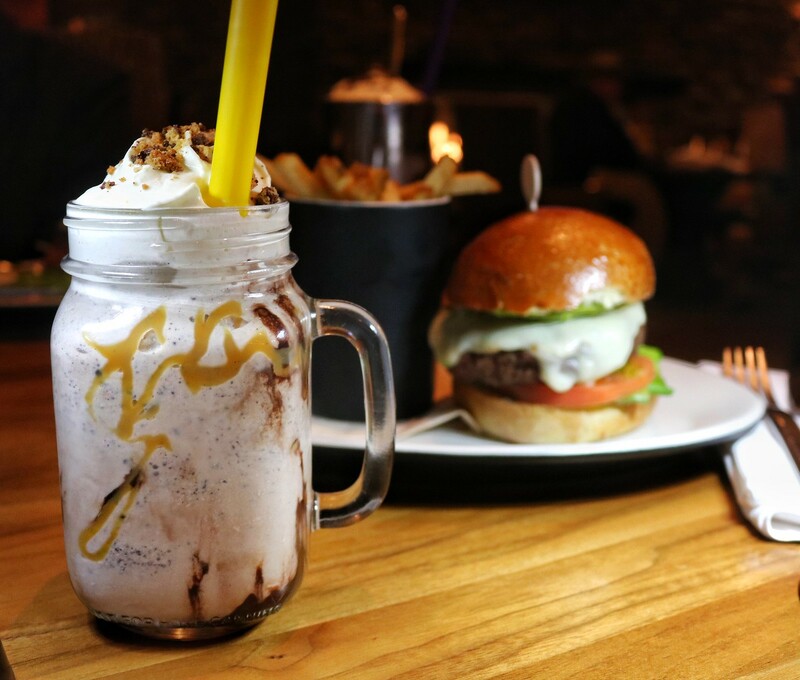 If you desire the southwest flair but would prefer it in American comfort food, then Cayton's CB2 Burger Bistro is your go-to. 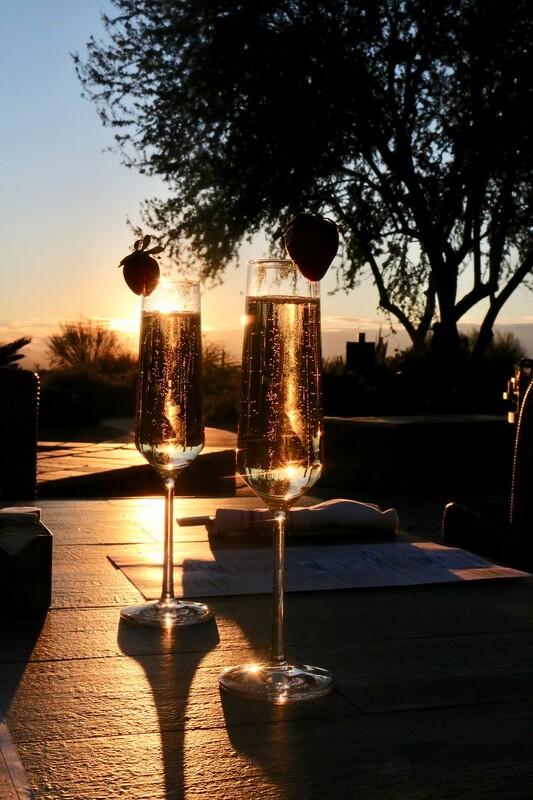 Located down by the Golf Club, Cayton's interior resembles casual elegance, while the outdoor seating showcases a beautiful Arizona sunset in the evenings. Cayton's is less gourmet but still maintains high expectations. The green chile fries are what Cayton's Chef de Cuisine, Mani Ramalingam, called a "southwest poutine." The burgers are large, juicy and seasoned to perfection. The patties are then placed on a lightly-toasted brioche bun. The shakes at Cayton's don't disappoint either; my favorite was the "black and white," which is essentially a cookies and cream type. Thank you to the Ritz-Carlton for the wonderful anniversary celebration. Alex and I savored every bit (and bite!) of our visit and we cannot wait to return. Prior to traveling to a destination, I like to plan outfits that complement the surrounding area. 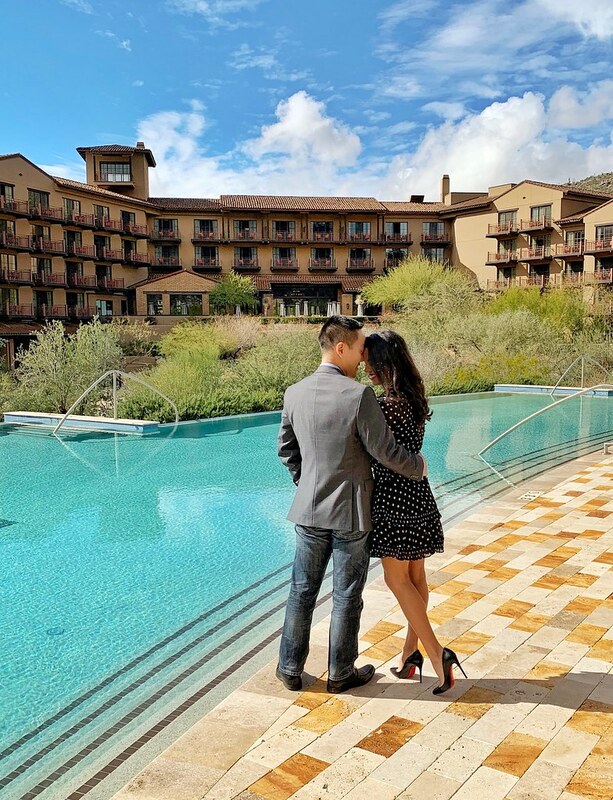 Over the weekend, I received a sponsored staycation at the Ritz-Carlton, Dove Mountain and had a fantastic time celebrating my anniversary with Alex. This desert oasis was established when the Riz-Carlton sought out inspiration from the richness and beauty of the Tortolita Mountains' surrounding landscape. To create an interesting outfit, you must have some sort of texture or detail that stands out. The color palette I created for my styled look was based off of the warm environment throughout the lobby and property. Along with rich-hued materials, you will find natural elements of stone, wood and metal integrated into the design of the Ritz-Carlton for a taste of Southwest flair. While browsing what to wear, I came across this beautiful, burgundy sweater from Ted Baker at Bloomingdales (same, similar from Shein), and it's on sale! The material is well made and soft enough to wear all day. My favorite feature aside from the color would be the ruffle details along the neckline and sleeves. To balance out the rich hue, I paired the sweater with a tan, suede a-line skirt from H&M that I found in the fall (similar from Madewell, similar from J.Crew Factory). The shade of tan reminded me of the Sonoran desert which the resort resides in. For jewelry, I went with rose gold from Kendra Scott. The Ott (same) is by far one of my favorite bracelets and I own it in multiple metals. The asymmetrical earrings (same) I selected because of the berry agate stone. The floral embroidered tights I came across during one of my several Target runs while looking for office supplies... frankly who doesn't browse the entire store when they come in for one thing at Target? The tights are one of my favorite features of this look because I haven't seen a pair like this before! The Vince Camuto t-strap pumps I bought from Macy's a few years ago and they are my favorite fall and winter shoe! Lastly, the lip gloss I'm applying is my go-to from Buxom (same)! I'm working on a recap post of the entire weekend but am collecting additional details to ensure my facts are in order, particularly for the culinary experience. I hope you will end the week strong– you're almost to the end! Getting married was easily not only the best day of 2018 but my entire life. I am immensely grateful for the marriage Alex and I have together. I truly enjoyed planning out our wedding and having my loved ones there. We have now been together for 12 years (this Saturday, Jan. 12!) and will celebrate our first wedding anniversary next month (Sunday, Feb. 17). While I wasn't able to be as involved in blogging in 2018 as I was in 2017, I am proud of the sponsorships I had. 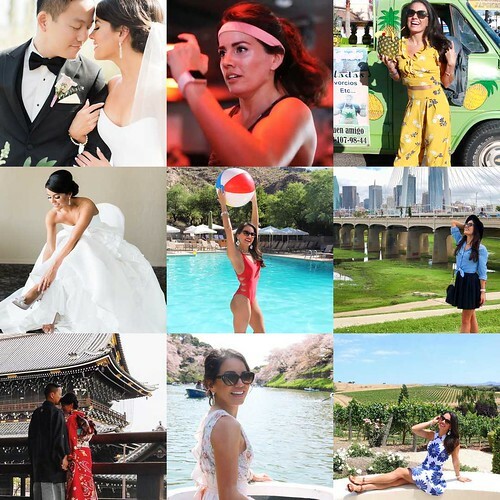 Creating a video for Orangetheory Fitness was a milestone for me because it was the first time I had hired a videographer to create sponsored content. I knew that I wanted to have content that was energizing and aligned with both of our brands. The videographer I met during a sponsored trip with Visit Puerto Peñasco, and we ended up connecting well. I strongly advise to always be on the edge and build those relationships whenever you can! It was my second year of working on sponsorships and I couldn't believe I had my first sponsored collaboration for a trip outside the county! I partnered up with OH Advertising and Visit Puerto Peñasco for a weekend trip. It was one of my goals in 2018 to do a sponsored out-of-town trip and I was surprised to get it so early in the year! The timing of the trip was pretty fast because I had just gotten married the following weekend. Loews Ventana Canyon Resort is one of the brands in Tucson I established a relationship with over the 2018 year. I partnered up with them a few times and I look forward to continuing our collaborations together in 2019. I made a decision to be intentional with whom I plan to partner up and create relationships with for my blog. 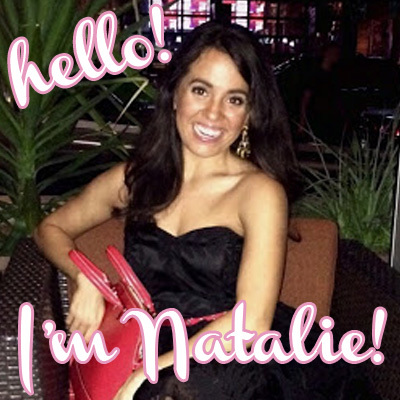 Each blogger and influencer is different, but I prefer to be selective in my partnerships. As I have grown, I have recognized who and what I truly wish to work with. Mental Health is honestly a topic I never thought I would find myself discussing in detail. 2018 taught me every person needs to be aware of their mental health. We all need to practice mental health and be greater aware of how we truly feel about things rather than constantly suppressing our emotions to "be strong." The biggest lesson I learned was that it's okay for every day to not end on a positive note and high victories. I found myself at greater ease when I found acceptance in the notion that "tomorrow is another day" to get back onto my feet. Happy Easter!! 💐 He is risen! Alex and I celebrated Easter rowing around the Imperial Palace in Tokyo for day two of our honeymoon! The cherry blossom trees are everything we hoped for. 🌸🏯⛩ What are your Easter plans? We miss celebrating the day with our family! I have always wanted to visit Japan since I was in middle school! The trip to Japan for our honeymoon blew us away! I have a blog post I plan to write to recap our trip and the three different cities we went to. Why we loved Japan: culture, food, architecture, transit, efficiency and history. We joke we would move there if we could speak the language proficiently, but realistically I don't think that will happen. In the meantime, we're planning our second trip to Japan in October!! We cannot wait. There's a wonderful sense of being alive when traveling and it's something I plan to coordinate more in the future with my husband and friends! I have a few trips in mind but you will have to wait to see what those are. Overall, 2018 was a year of growth for me. I learned much about myself and what I'm capable of. I am applying those lessons towards 2019 and the rest of my life. After all, life is a journey where we encounter experiences that shape us more into the person we actively seek to become. No matter what happens in 2019, keep your ambition and head high!